Hostelworld.com will charge a deposit for group bookings by credit card. The remaining amount can be charged by the property to the guest’s credit card within whatever time-frame you specify or on arrival if you prefer. The Real Vang Vieng Backpackers Hostel is a newly opened Backpacker Hostel in Vang Vieng (8/2015). With the best location right in the heart of the little city, we offer everything what a backpacker heart needs. We provide 6-bed-dorms and private rooms for one, two or three people. All our rooms are newly renovated, very clean, with thick comfy matresses, controllable Air-Conditioning, hot showers, free wi-fi in all the hostel and a free breakfast (out of a choice of 5), all that for a very good price. 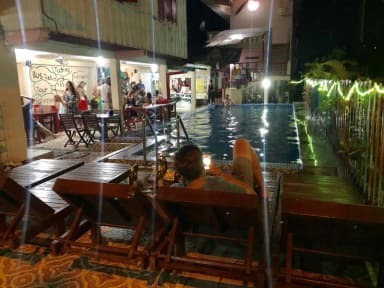 We also offer a choice of western and vietnamese foods, drinks, cheap bus tickets all around, as a free soccer and pool table in our common room, where you can just hang out, have a drink, get ready to party, play games or just have a chat as there are always people around. You will find yourself in the center of Vang Vieng, with everything just close by, as all the restaurants, streetfoods, all kind of shops, motorbike rentals, tubing rental, ATMs, banks, travelagencys and what else you need. There is a lot to do in Vang Vieng so we offer advice and cheap tours aswell to help you to find exactly the things you want to do. Tubing down the river from bar to bar (you can do that on your own), tubing and kayaking in the cave, zip-lining in the mountains, climbing, going around on your own with motorbikes or just hanging out and chill. Real Backpackers Hostel Vang Vieng is a cheap and laid place to base yourself in Vang Vieng. A perfect hostel, nice breakfast, nice location, nice swimming pool, and perfect to meet chill people ! Awesome pool! Sheets seem I cleaned, but the pool makes it worth the stay! Not very clean but absolute worth the cheap price! We really liked our stay here, so much nice people! Some of the staff spoke bad English, and it was hard to communicate with them, while others were super helpful and friendly. Food wasn't the best but the breakfast was free. Pool was clean. Great atmosphere at night! Breakfast is amazing. The pool is really good as well considering the price. However, the hostel is owned by a family, meaning you’ll be woken by screaming babies at 7am. The bed sheets are stained and the air con is ****. The en suite bathroom is vile. The sink isn’t attached to the plumbing so it just flows onto the floor. For £3.50 we didn’t expect much but could have been cleaner. Wouldn’t recommend overall but if you’re looking to save money then it is cheap! Worst hostel I’ve ever stayed in. Firstly, you’re not given a key to the room so it’s always unlocked. The aircon is basically non existent as its on for about 4 hours in the night. The bathroom is a state and the sink isn’t connected so as previous reviews have said, you spit toothpaste on your feet. 100s of mosquitos and ants in the room!! Breakfast is appalling and to top it all off my sliders got stolen from the front and the man at the desk did nothing about it. Save aggro,don’t stay here. Not sure why this hostel has had so many positive reviews. Although the location is central and the pool area is ok, there really isn’t anything more positive to say. The sheets in the dorms are stained, the plumbing in the bathroom is broken and the whole dorm (especially the bathroom) is really unclean. Security is also very poor as the dorms do not lock so anyone can walk in. WARNING!!!! WARNING!!! POLICE!! POLICE!!! CORRUPT HOSTEL WORKERS CALL THE POLICE TO ARREST GUESTS!! IT WILL COST YOU $600 TO GET FREE!! STAY AWAY!! !